Finding accessible, free winter programming for families, in a city as metropolitan as Toronto, can be difficult. But, Ontario Place is stepping up with two incredible options this season. The picturesque West Island has transformed into a Winter Wonderland offering activities that are perfect for a family getaway, girls night or a date-night type escape. It’s Toronto’s newest “IT” destination. This year marks the second year for The Winter Light Exhibition. Eighteen new, unique and illuminating exhibits, created by local artists, light up the park from sunset until midnight each day. The mediums constructed by these talented creators incorporate everything from video games, sound, architecture and more. Strolling through these exhibits is absolutely free and they’re an incredible, Instagrammable site. There’s also free skating on the island with views of Toronto like you’ve never seen before. Essentially, as soon as the park opens (5 am) until close (midnight), you’re free to use the synthetic rink with your own skates, helmets and warm gear. If you need rentals, they’ve got those too with on-site skate rentals (just check here to confirm hours of operation). Since it’s a synthetic rink, it’s not weather dependent so you’re free to visit any day of the week until March 17, 2019. Skating Party! 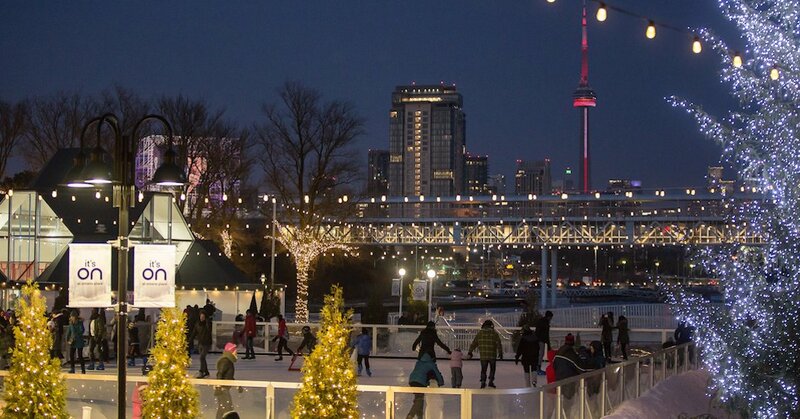 Make your Saturday night one to remember by attending one of the Ontario Place skate parties. Forget a standard girls night out to dinner and drinks. Instead, visit Ontario Place and enjoy music from local DJs, hot beverages and the bonfire. 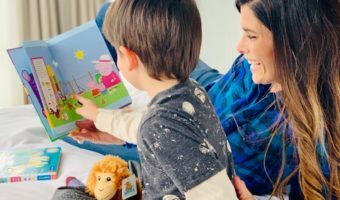 Or, bring your family for the weekend and book a stay at a nearby Hotel (like Hotel X Toronto located directly across the street from the park). Need a way to Warm Up? After skating, touring the light exhibit and strolling through Trillium Park or the William G. Davis trail, grab a cup of hot chocolate and some s’mores kits from concession and enjoy the evening around the community bonfire. It’s such a great way to capture a quiet moment together or meet new friends. Along with the bonfire treats, you can also dine on Canadian classics from the food truck: Poutine, BeaverTails, hot dogs and more are available on site for lunch, dinner and snacks in between. And, we can’t talk about Ontario Place without mentioning one of the biggest highlights of the grounds: The IMAX Cinesphere movie theatre. The theatre reopened last November and people are thrilled. To keep the momentum going, they’re offering a line up of movie classics like Blade Runner Final Cut, Die Hard, The Fifth Element, The Polar Express and The Incredibles. For show times and movie listings at Cinesphere check out their website. Note: the Cinesphere is not apart of the free activities. Tickets can be purchased in advance (online) or on site. It’s truly a remarkable movie experience and every time I’ve been there (from childhood until parenthood) I vividly remember each experience. They’ve got a new 80 foot x 60 foot curved screen using state-of-the-art laser projection and it’s the worlds FIRST permanent IMAX theatre. 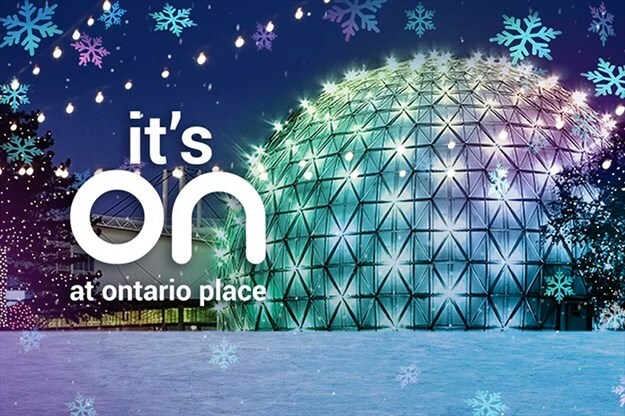 Overall, Ontario Place is really kicking up their community activities with some exceptionally festive, fun and romantic activities. It’s such a great way to feel as though you’re escaping the hustle of the city without having to travel far. We’re encouraging families from near and far to make this a destination this holiday season. It’s a very cool, unique experience for singles, couples and families alike. From November 29-December 30th, you’ve also got the option of a more interactive North-Pole, playland type experience at Ontario Place: The Aurora Festival of Lights. It’s the first year this event is coming to Toronto and people are already buzzing about it. 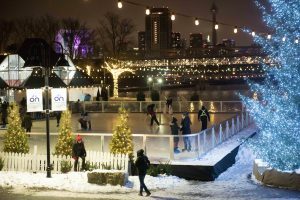 The East Island will transform into a winter experience like none you’ve seen before in this city. The Aurora Festival of Lights promises everything from playful displays, games and character meet-and-greets to a market, amusement park rides and food options. It’s presented in partnership with the Canadian National Exhibition so you can imagine what sort of fun you’ll encounter here. The Aurora Festival of Lights is being touted one of the most exciting holiday festivals this year. The focus here is more on the North Pole and the magic of the festive holiday season. These two experiences at Ontario Place are very different. While Ontario Place Winter Program is free and open for the entire winter season (until March 17th), the Aurora Festival of Lights requires entry tickets starting at $14.99 per person and ends right before the new year. There’s been a bit of confusion about these two events so feel free to message us or DM us with any specific questions.